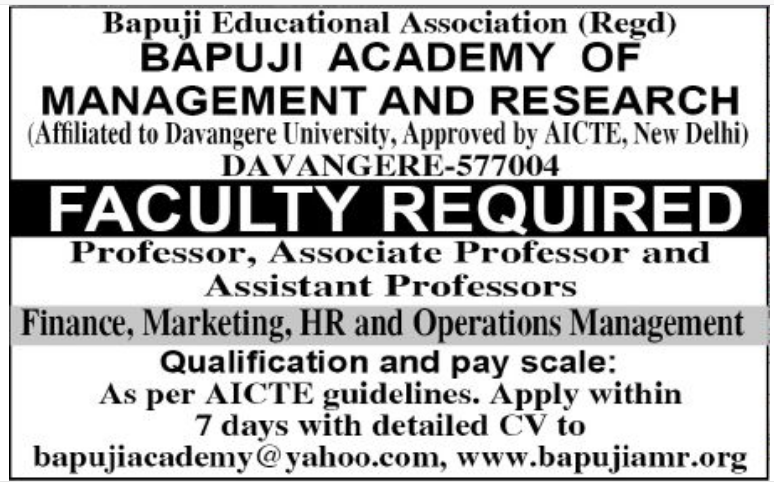 Bapuji Academy of Management and Research, Davangere has advertised in the DECCAN HERALD newspaper for the recruitment of Teaching Faculty- Professor / Associate Professor / Assistant Professor jobs vacancies. Interested and eligible job aspirants are requested to apply within 07 days from 03rd April 2019 . Check out further more details below. College Profile: Bapuji Academy of Management & Research is a flagship of BEA, located on an extensive state-of-the-art campus in Davangere. Institute is offering a masters degree in management under MBA Programme Bapuji Academy of Management & Research (BAMR). One of the very few exclusive campuses in the state of Karnataka, with world–class infrastructure and learning ambiance. How to Apply: The candidates are requested to send application along with their updated resume, copies of certificates and recent PP size photos to the email address provided below.